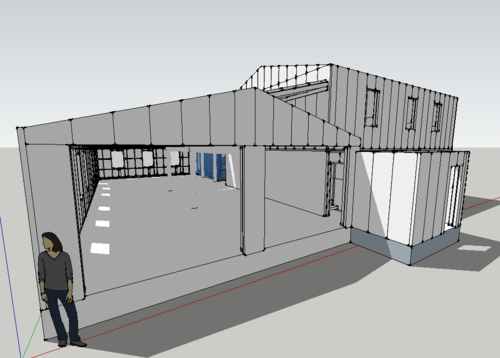 Shortly after Peter drew up our working drawings last year, I started work on a 3D model of the garage & unit in Google’s free Sketchup tool. This is a brilliant program, not quite CAD but brilliant for conceptualising pretty much anything in 3D. Google use it to model cities in Google Earth, to give some depth to their 2D satellite imagery. The great thing about producing the model is that I can catch these little gotcha’s before we get anywhere near making the mistakes on site where they’ll cost $$$ and time. 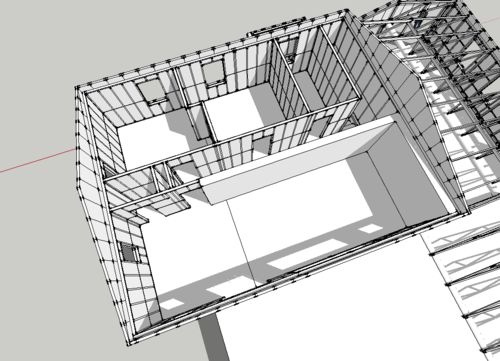 It also allows me to produce accurate estimates for materials too - I can visibly see how many Hebel panels we need, how much timber framing we’ll need, etc. meaning with any luck we’ll save some money by ordering only as much material as we’ll need. A kookaburra’s eye view of the unit from behind, overlooking the patio above the shipping container. 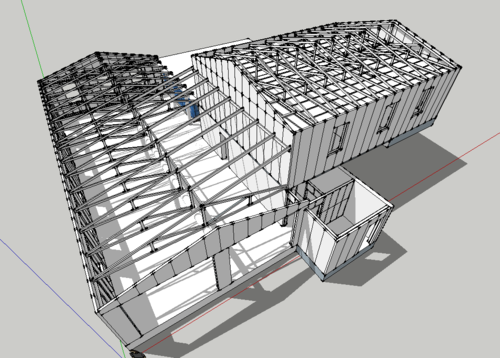 A few layers stripped back, showing the roof construction. The jack trusses and rafters in the garage not only provide a good up-and-over profile for a passing fire front, but conveniently I gain some clear space under which to install a two-pillar car hoist, for working on my Minis (and the odd Hilux). More roof stripped away above the unit, showing the floor plan. On the south side of the building we have the two bedrooms and bathroom, then a central rock wall for internal thermal mass in the living space. The eastern-most part of this area will initially be fitted out as a kitchen, but thanks to planning regulations this will be removed once work is completed on the house proper, in order to classify the unit as dependent on the house and not self-sufficient. This one shows the ground floor layout. At the front of the building we have the pump room, which will house our petrol fire pump which will also be used to pump water from the collection tank(s) around the garage, up to our main header tank at the top of the hill. We’ll do this every couple of weeks, primarily so we know we always have a working fire pump - so many stories emerged from the Black Saturday fires of fire pumps failing through disuse that we’re not going to fall into that trap. 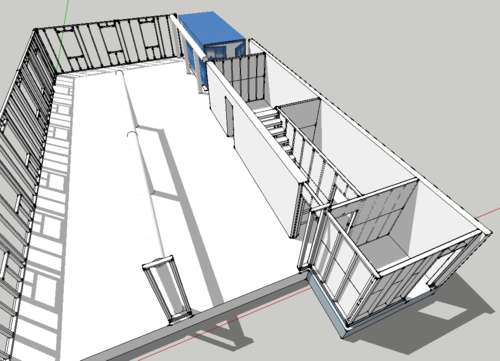 Beside the stairwell will be our power room, housing batteries, inverter and controller for the solar system. Behind that is a clean / wash room, so we have somewhere away from the dust and grime of the workshop. 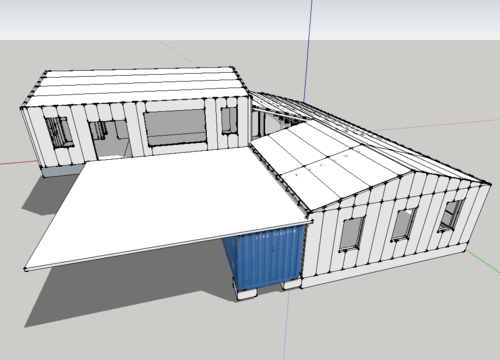 Then the container, which will serve duty as a store room.